The SETTER CAMP is designed as an intensive training opportunity for intermediate to advanced level volleyball players looking to improve their setting skills. Athletes registered for this camp should have at least 1 year of playing experience. This specialty camp will focus on intensive setter training including hand position and release, footwork, jump setting and offensive systems. Camp staff will use video analysis and feedback throughout the camp. Since we also run a hitter/libero camp concurrently setters will have the opportunity to work on setting various hitters and train in competitive drills as well. This setting camp is a great addition to the Carolina High Potential Camp or preparation leading into the Skills Camp. The HITTER CAMP is designed for the player interested in specialized training as an OUTSIDE HITTER, MIDDLE HITTER, RIGHT-SIDE HITTER. The hitter camp is geared for the beginner to intermediate or advanced level volleyball athlete, where players are grouped by skills and experience. 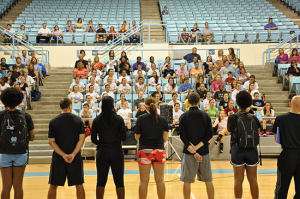 This camp is a three-day training camp and conducted in air-conditioned Eddie Smith Field house, and Fetzer Gyms on the campus of the University of North Carolina. The LIBERO CAMP is designed for the player interested in specialized training as a libero or defensive specialist. This camp is geared for the beginner to intermediate or advanced level volleyball athlete, where players are grouped by skills and experience. This camp is a three-day training camp and conducted in air-conditioned Eddie Smith Field house, and Fetzer Gyms on the campus of the University of North Carolina. Includes TUITION, HOUSING (two nights housing), all MEALS and camp T-SHIRT. Commuter rate includes TUITION, MEALS (lunch and dinner) and camp T-SHIRT (no overnight accommodations). Commuters report to Granville Towers each morning for camp check-in. SUNDAY, July 21 – 12:30-2:00 PM at Granville Towers WEST (Lunch is not included on the first day; first meal is dinner on July 21).